In 2013 I was walking at the beautifull city of Cádiz, Spain, where I was to learn Spanish. I saw people running and thought: “What can it be that those people keep on running, isn’t that boring? At that time, I lost approximately twenty kilograms and had some problems loosing the last five, to get to a healthy weight. So I told myself: “let’s try running for 5 times. If I don’t like it, I can choose another sport. But if I do, I can buy myself some Asics.” So I did. I loved every kilometre. Only a few months later, my dad got diagnosed a terminal form of cancer. He was so proud of me, when he saw me doing sports! Within one year, I trained for my first marathon, the New York Marathon. Right after finishing that, I called my dad and we both cried. A few hours later I got a call from my mom, that my dad had to go to the hospital. I got to show him my medal, that is my most precious memory. He died only a few weeks later. Running helped me to process the loss, helped me to loose weight, but most of all: it gave me so many friends! I don’t know any other sport where athletes bond so easily. It doesn’t depend on how fast or how slow you go, just being a runner makes you good company. There’s little Runners that don’t award other runners. Because most runners run for themselves. They, as I do, love to be outdoors, enjoying the scenery, the sun or rain on their skin, the steady pace in which they get to their Runner’s high. It clears your mind, your lungs. You see things more clear. For me, I’m not the fastest. Sometimes I disappoint myself in not going as fast as I have trained for. But I keep going. I want to be the best version of me. Sometimes I forget to enjoy the results I’ve booked so far. Therefor, I use Instagram account. It’s my diary of runs I did, people I met and ran with. I love to scroll back from time to time and see how far I got. I love to run marathons. Just because it’s such a magical distance. You have to train well for it, you need to watch your food, know how tapering works. I love the many emotions that come by as you run one. I always think back of the miles I ran, with who and where. Because running, for me, has become so much more than just taking a lot of steps in a fast way. It is my way of life. 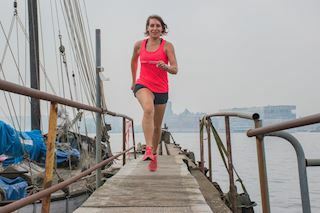 I live in the Netherlands, where I’m part of two running families: my running crew Running Rebels Rotterdam and my running team ASICS Frontrunner. It is so nice to share thoughts, tips and tricks with these people! They inspire me on a daily basis to be better and stronger. I learn new places, routes and cities. But even my own residence I know and enjoy better because I run. You come to places you wouldn’t see otherwise by just running with your heart. Let it wonder! You can always get back. Or find a colleague runner, because he or she will probably help you. That’s how we are.